ANTONIN GREGORY SCALIA was born on March 11, 1936, in Trenton, New Jersey, the only child of Eugene and Catherine Scalia. In 1982, President Reagan nominated Scalia to join the U.S. Court of Appeals for the District of Columbia Circuit. Four years later, Reagan nominated him to the Supreme Court of the United States, to which he was confirmed by the Senate, 98- 0. Justice Scalia took his seat on the bench on September 26, 1986. 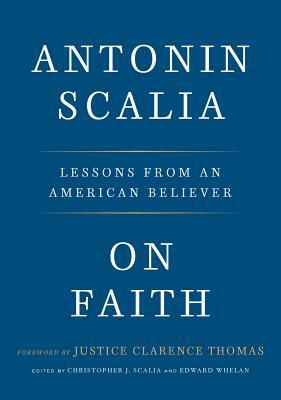 As a Supreme Court justice, Scalia articulated and exercised the interpretive methods of originalism and textualism. He established himself as a forceful presence on the bench, a vivid and compelling writer, and a gregarious public presence. One of the most significant justices in the history of the Court, he served for nearly thirty years before his death on February 13, 2016. Antonin Scalia was married to Maureen for fifty- five years. Together they had nine children and dozens of grandchildren. He was a loving husband, a devoted father, a devout Catholic, and a proud American. CHRISTOPHER J. SCALIA, the eighth of Justice Scalia's nine children and a former professor of English, works at a public relations firm near Washington, DC. His book reviews and political commentary have appeared in The Wall Street Journal, The Washington Post, The Weekly Standard, and elsewhere. He lives in Virginia with his wife and three children. EDWARD WHELAN, president of the Ethics and Public Policy Center, is a former law clerk to Justice Scalia. He is a leading commentator on the Supreme Court and on issues of constitutional law. A father of four, he lives with his family in the DC area. Mr. Scalia and Mr. Whelan previously co-edited Scalia Speaks: Reflections on Law, Faith, and Life Well Lived (Crown Forum, 2017), a New York Times bestselling collection of Justice Scalia's speeches.